Does campaign giving lead to generous business subsidies? The National Institute on Money in State Politics, known better by its nickname Followthemoney.org, treated New Mexico to its own close up in a blog published today. You’ll recognize the names of many. They’re some of the best-known corporations in the U.S.: ConocoPhillips; Intel; Hewlett Packard; Verizon; Fidelity Investments; and Sony. A few others rounding out the Top 10 aren’t as well known, but they have – or have had — high profiles here in the state, such as Eclipse Aviation, Forest City Investments, Schott AG and Lions Gate Entertainment. Back to the Institute’s findings: Large subsidies don’t always follow from huge campaign giving. ConocoPhillips gave slightly less than $300,000 during the 14 years analyzed, and was outpaced by 47 other contributors. 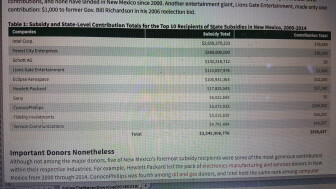 Intel ranks 226th on the list of state-level contributors in New Mexico. Hewlett Packard, meanwhile, ranks 303rd with $57,280 in donations. In fact, 2012 was the sole year in which any of these donors were among the top 20 state-level donors; ConocoPhillips gave $77,000 that year, the 12th-largest contributor total. But — there’s usually a but, isn’t there — some of the recipients receiving the most subsidies did give more in campaign contributions than many other companies in their respective industries. 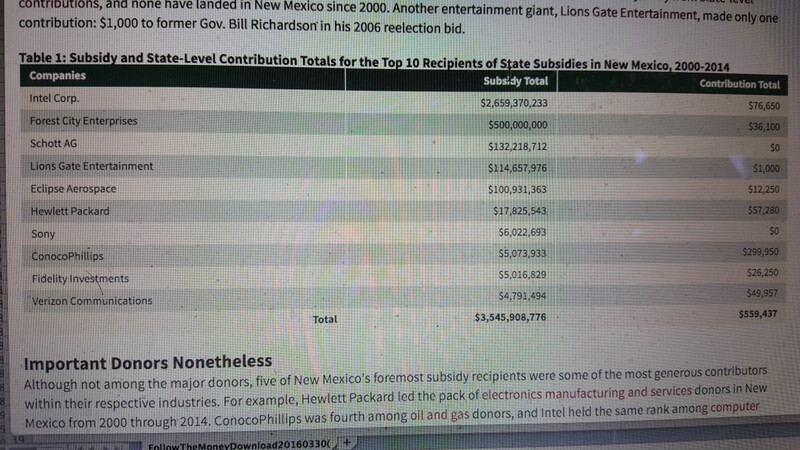 … Five of New Mexico’s foremost subsidy recipients were some of the most generous contributors within their respective industries. For example, Hewlett Packard led the pack of electronics manufacturing and services donors in New Mexico from 2000 through 2014. ConocoPhillips was fourth among oil and gas donors, and Intel held the same rank among computer equipment and services donors. You can dig around in the Institute’s data to see, for example, who among New Mexico’s politicians and candidates received campaign contributions from the corporations over the past decade and a half, the timeframe for the Institute’s analysis. A move by the BLM to charge royalties on venting and flaring of natural gas will be the topic of TV ads targeting New Mexicans this month. Western Values Project, a Montana-based nonprofit, has contracts to spend about $123,000 in the Albuquerque market.